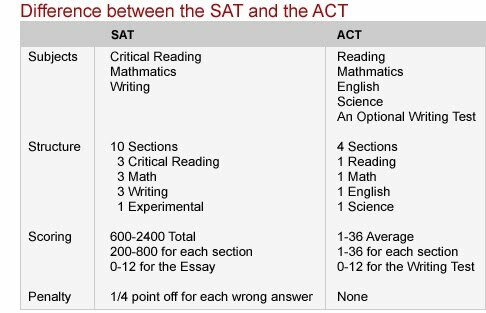 Colleges accept either one of the SAT or ACT. Neither test is easier than the other. Some students perform better on the SAT while other do better on the ACT. Students should take the one that will give them higher scores and the one in which they can achieve more improvements. The SAT requires a 25 minute essay section. It counts toward the 200 - 800 score for the Writing section. On the ACT, the Writing Test is optional. It also does not count toward the 1 - 36 scores. The SAT places more emphasis on vocabulary than the ACT. The ACT covers more math concepts. The SAT covers only algebra and geometry for its math section. The ACT tests trigonometry in addition. However, the ACT is not necessarily harder than the SAT by any means. The ACT has a science section. Do students have to know complex concepts from biology, chemistry, and physics classes? No, the science section does not require any of such knowledges nor memorizing any formulas. Rather, it is designed to test students' reading skills and analytical reasoning. However, if you excel in science and have profound reasoning abilities, you might want to consider taking the SAT instead. The SAT has 10 sections. The ACT has 4 sections. The SAT is broken up into more sections of different lengths. It has 3 sections for each Critical Reading, Math, and Writing. The ACT has 4 sections, one for each Reading, Math, English, and Science. Each section of the ACT has a longer time limit but has more questions. On the SAT, you will have to solve critical reading, math, writing in any order (except for the first and the last sections which are essay and a short writing section).